When one of my favorite people announces that she is going to be having a blog hop, I am all for it. Especially since Lori Anderson of Pretty Things has had to cut back on the hops because of some health challenges. This hop took a little, no let's make it a lot, more thought than most of the ones that I participate in. Figuring out what disease or condition that I wanted to shine a light one was easy since both myself and my husband have fibromyalgia. The color for this condition is purple. The next step was figuring out just what I wanted to have added to my little word bean. Yeah you heard me. Since Heather of Swoondimples was making each of the 'beans' individually, we got to personalize them. It took a couple weeks but what causes me to push past the pain is being able to provide a home for my husband and our various furry members of our family. I really stepped out of my wheelhouse designing this necklace as I went totally asymmetrical with the 'bean' off to one side. Also (are you ready for this) it doesn't have any of my beloved 'gemmies' in it. Instead I used a combo of Czech glass and sea glass as well as a pewter clasp. It is all knotted up on Irish Waxed Linen. I am really happy with this necklace and have worn it a few times already. It is the first time I have really worn any awareness jewelry but that is going to change. Now to hop about and see what everyone else has chosen for their cause and what words are important to them. ( I do want to apologize for not having the list of designers posted on my blog but while I got the post done early, I had planned on adding the link list. A migraine waylaid me.) Just click here to get to all the designer links. Can Herbal Medicine Help Fibromyalgia? Love this! I can so relate to your push through the pain to provide a home mentality. You've really created a wonderful design for both awareness and I'd guess every time you where it, it will remind you why you keep going. LOVELY! Are the purple tubes czech? I LOVE them! Gonna have to check out Swoondimples, too - I've been looking for 'word' beads for a while now. =) Gorgeous piece! I love your necklace! The asymmetrical design really highlights the bean bead. I also love your sentiment. Home is the BEST! I thought of your posts talking about efforts to buy your house (yay!). Although you continue to have to push through the pain of fibro, you win because you have created a wonderful home for your family. 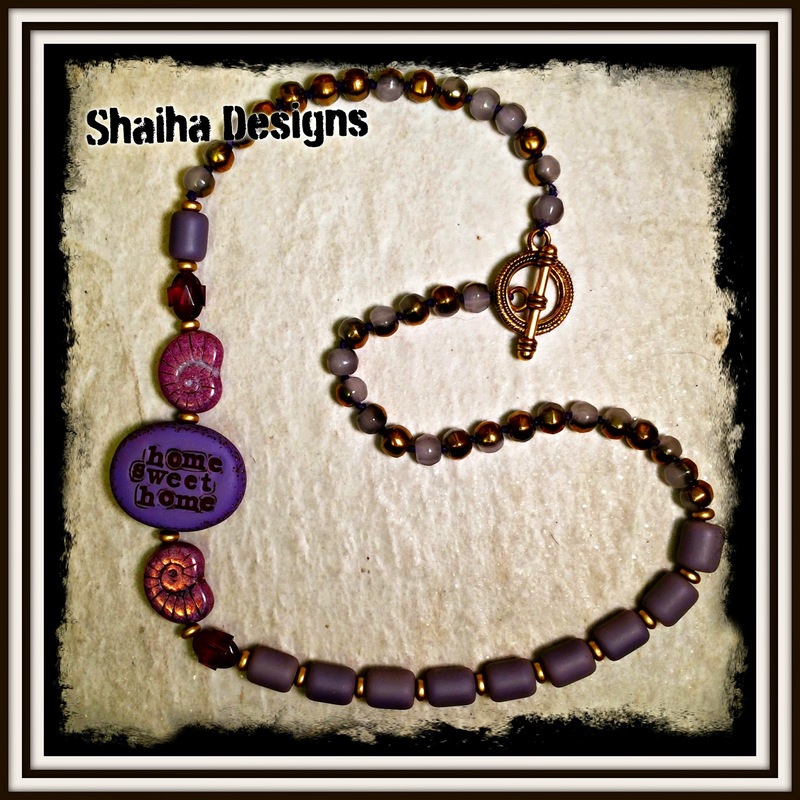 I love it Shaiha, I think you'll get a real kick out of wearing this piece and being reminded what it means to you. The necklace is lovely. I try to challenge myself with asymmetry sometimes too. You did a wonderful job. Great color choices too. There's no place like home. Shai, this is totally outside your box, no "gemmies", asymmetrical.......... I love your bean. Home, after all, is where we go when the world around us is too much. To be able to create that sanctuary for your family and your fur babies is a blessing for sure. This is completely outside of your box. I love it, and the sentiment behind it. Your word bean choice and design is lovely. I really love the asymmetrical design. And way to go pushing outside of your regular design choices to create something so interesting and new. Great job! Hi Shai, your necklace is really lovely. It fits your life and is a nod to you getting your house. Congratulations. Beautiful and colorful - I love the sentiment! I love your choice of "home sweet home" and the cool asymmetrical design of your necklace! Absolutely gorgeous piece! Home is everything, isn't it? Those people that make that home, that place we make home. Yes. This is beautiful. Thank you so incredibly much for sharing! And way to go on going out of your comfort zone! I just love that saying! You have strung it beautifully! Wishing both you and your husband days on end of pain free living - as much as you can get! Love, love, love the necklace! I also think your word choice is perfect. I am so glad you stepped out of your comfort zone because the piece is perfect! A very nice necklace tribute to your special place. I took a look at your jewelry and can see how you pushed yourself out of your usual range, and it's great that you are so happy with it. Best wishes to you and your husband for good days. What a beautiful piece! And you should be proud of stepping out of your comfort zone. You stepped out exceptionally well, gorgeous necklace, love the sentiment! Beautiful necklace. My husband suffers from neuropathy which is as bad as fibromyalgia and has to take meds for it. So I can understand your pain. Keep up the good work and I love your necklace. I too have started wearing my awareness piece to see if anyone notices....Thanks for the great post. I love the asymmetry, and I love the beads! And I'm honored you joined my hop!